View towards Martha's Vineyard from front lawn. Stunning views of Little Pond, great place for morning coffee. 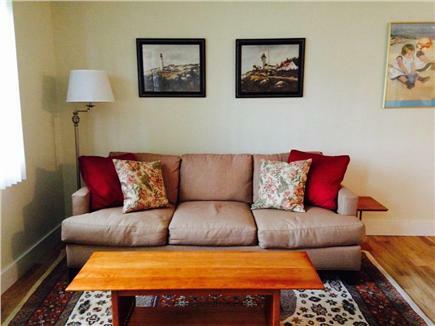 Nestled on a low bluff over Little Pond, this home is a short walk to both Bristol and Falmouth Heights Beaches. Back at this well-stocked home, enjoy the breezes off Vineyard Sound and Little Pond while you barbeque and enjoy cocktails. 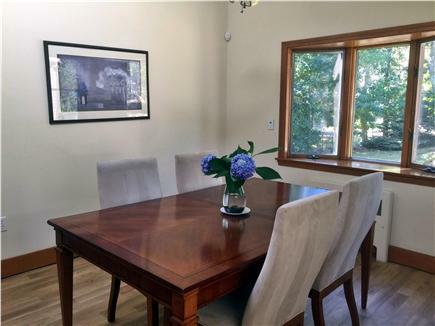 On a quite side street, the single level home is newly redecorated with fresh interior paint, new beds and updated furnishings, perfect for family and friends vacation. 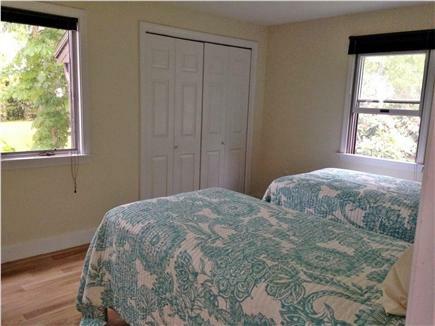 Three bedrooms, 2 with queen beds, one with twins, all with new bedding, allows comfortable sleep accommodations for 6 people. The kitchen and living room are open floor plan and there is a separate dining area and an updated bath. Plenty of off street parking on this 1/3 acre property. Bedrooms are air conditioned while the common areas are airy, breezy, with many fans. Quick drive to town, movies, groceries, and ferries to the Vineyard. Not far from the Shining Sea Bike Trail. Walk to the July 4th fireworks! Walk home from the Falmouth Road Race finish line! 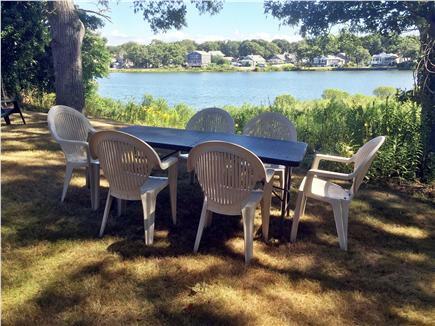 Great location for spring, summer and fall Cape Cod vacation. Additional availability info: Off-season weekends available in year-round house with central heat. Please contact us for details. This is a Saturday to Saturday vacation rental. Long-Term Rental (1 month or more): We will consider a winter rental if for multiple months, if rental is 6 months of more from Sept to June. Shorter rentals are also available. This is a year-round home with reliable heat in a neighborhood where many people live in the off season but still quiet and serene. We require proof of employment prior to any longterm rental consideration. Please contact us for further information. Additional pricing info: Off season rental, Sept to June, with references and employment verification, State and local taxes of 12.45% will apply. This is a single story building with approximately 4 steps to get into the home. Doorways are standard. The washer and dryer are in the basement which is down a flight of stairs. Margaret's place was very clean and a great location. Margaret was very easy to communicate with and made sure we had everything we needed. Margaret was very flexible and accommodating. Place was extremely clean, with all the clean linens you could ever need. Shower was great and beds were extremely comfortable. We enjoyed our stay! Great house in a nice location near everything but on a nice quiet street. We could walk everywhere and the beach is a short distance away. The layout of the house is great for families and the kitchen had everything we needed. Owners were very responsive and we found the place spotless when we arrived. Thanks for a great stay! Another great stay, this is our second year staying in this home. Great location, waking up to pond view is priceless. Very quiet neighborhood, private yard. It was a pleasure to meet you. Our stay was wonderful. The house was completely as advertised and perfect for our family and grandma. The neighborhood was lovely - very quiet but close to everything including two beaches a very short walk away. Thanks for an easy experience. We had a great week. We loved your home and the neighborhood. Thanks for sharing! The hosts were very welcoming, and informative about the house. Bedrooms & yard were beautiful & comfortable. Perfect vacation home, plenty of room for a family of four. The house is on very quiet and safe side street. 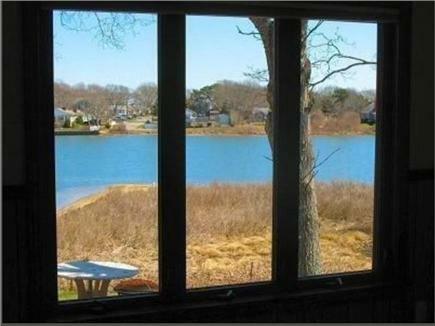 Great views of the salt pond from the backyard. We enjoyed our stay and will consider a return next year. House is very nice, washer and dryer in basement. We had coffee every morning looking at the ocean, very relaxing. House is on very quiet street, almost no traffic very safe for children. The beach is a 5 minute walk, very peaceful. Restaurants are across the street from beach, good food and service. We have already made reservations for next year. Thank you! We look forward to having your family visit our lovely house next year. 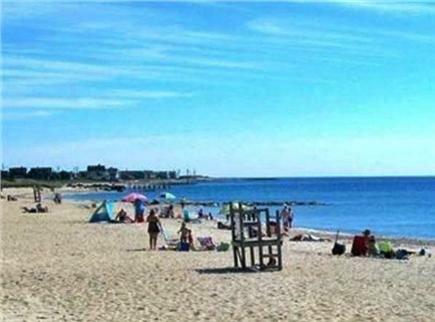 As homeowners in Falmouth, we enjoy sharing our beautiful community, Falmouth, MA. This home is in such a special location, on a side street so quite that it is a favorite of young children learning to ride a bicycle! At the same time, you are a short walk to the ocean beaches and a quick drive to town, shopping, and all that Cape Cod has to offer. The house is comfortably and freshly furnished. There is no air conditioning but there are ample fans in all rooms that keep the house quite comfortable, particularly in the evening. Falmouth, MA is a beautiful New England/ Cape Cod town abundant with history, culture, and picturesque views. The welcoming tone of the town is a plus. We have a weekly Farmer's Market, family-friendly movie in a downtown park, a beautiful merry-go-round, countless great places to eat, and more coast line than any other Cape Cod town. The ocean water is warm enough for swimming!